Today, I am going to post about knowledge. It is probably one of the most powerful tools we can possess. Although it is important to have knowledge, it is more important to know how to use it. I know this sounds like an obvious thing to blog about, but I am going to focus on one type of knowledge in particular, that of copyright law. Many people think they understand how copyright works and how it serves to protect ones work. I have had an up close and personal experience recently that put the knowledge I thought I had into sharp focus. Here's the gist of copyright. Let's say you write a pattern (I am using that because that is what I do, but you can substitute anything here that you can file a copyright for). When you write something that you don't want someone else to literally copy, you can place a copyright symbol and the year on this work along with your name. This is called giving notice and tells anyone who picks up your work and reads it that they cannot take it as their own. The US Copyright Office recognizes notice as an official copyright without having to file a copy with them. However, if someone does copy your work and you would like to be able to pursue damages, then you need to file your paperwork with the copyright office within five years of official publication (or three months if you want to recover legal costs). Most consider your work officially published the first time you place copyright notice on it or make it available to the public. This was all knowledge that I already had and understood (or mostly understood) in the eight years I have been writing patterns for sale in the marketplace. I also understood that this meant that someone cannot go to a copy machine and copy the work. This is a direct violation of copyright law, which is why places like Office Depot and Staples will not make copies of such works. They can actually be held liable for those copies! This serves obviously to protect the author's work. Most people understand this portion of the law and for the most part respect it (we hope!). This next part is where people get confused. Let's say that you come up with a design idea (like a bag with a removable liner) that you think is ingenious and you write a pattern for it. That idea is NOT protected under copyright law. Your interpretation of this idea is, like how you design it and how it works in your pattern, but only through the expression of it in your pattern. Copyright law allows for two people in different places getting the same idea at the same time and acting upon it. Why? Because these two people will interpret the idea in a completely different manner, therefore, both of their works are protected by copyright. If you visit the US Copyright Office's website, this fact is one of the first addressed in the frequently asked questions portion. Because copyright law works in this manner explains why there are a bazillion bag patterns that seem similar or a lot of other types of designs for that matter. Where copyright does protect is in the area of author's expression (words, illustrations, pictures, etc.). It is that intangible that makes your pattern read, feel, and look differently from someone else's. Every person has their own style of speaking and writing. When that comes through in written text, it becomes unique to that person, and is protected by copyright. Think about it, there are only so many ways to tell someone how to cut a square or rectangle or put a basic bag together. These are things that are in the public domain, and not protectable under copyright. It is what makes your writing and presentation unique that puts you under the copyright umbrella of protection. If someone were to copy that unique style into their own work, they are infringing upon your work! Being in the publishing business makes the author vulnerable to people who don't understand the way the law works. Unfortunately, we will encounter these people from time to time and it can be very expensive to defend yourself if this happens. I recently encountered one of these people regarding a pattern of mine. She too is a designer in the industry. She was under the mistaken impression that she could copyright an idea. It was interesting because her interpretation of said idea and mine could not have been more different and the best part of the whole thing is that I had never even seen her pattern before! If she or her lawyer had performed due diligence with a proper investigation, I would never have known what I know in-depth now, so you can call me a tad more knowledgeable. If you think that someone has copied your pattern, the burden of proof is upon you. The best thing to do in a situation like this is to see for yourself if there is anything to it before going any further. You end up saving yourself and others the hassle if you find there is nothing to it. On the other hand, you are prepared if you do find proof that your work has been compromised and you have made it easier for your legal counsel to investigate. In my opinion, any reputable lawyer understands that their reputation is at stake as well and will not work on your behalf regarding this type of allegation if they know there is no colorable claim. Thankfully, this situation ended in my favor as we were able to secure a release agreement from this person who acknowledged there was no infringement. What I want to impart to you is that we are all vulnerable (even our retailers) to people like this, and unfortunately, if you are put in this situation you may have to defend yourself. 1. Copyright law does not protect your idea. 2. Copyright does protect your published work as an "expression". 3. If you think that someone has infringed upon your work, do your homework and investigate! 4. Take action with legal counsel if you have proof that your work has been compromised. 5. Defend yourself, your work, and your reputation if you have to....it is worth it! Hey Everyone! Today I thought I would post about more of my favorite sewing tools, but first things first. You will notice an icon in the right hand column called "March of the Tools". This was ingeniously started by Heather Bailey last year when she blogged about some of her favorite tools, cleverly in the month of March! This year, she decided to design a great icon and ramp up this discussion so that lots of bloggers could participate. Be sure to click on the icon, as it will take you to her site where she will be linking to several of us who will be talking about our favorite tools this month. This week's post is about Irons....I know, it doesn't exactly make you want to jump for joy, does it? It never did for me, and I iron A LOT! I have been using Rowenta irons for a number of years and love them, but hated having to fill the water reservoir all the time. I think just about every time I was ready to iron, that thing was empty! Finally, I decided to investigate my options. 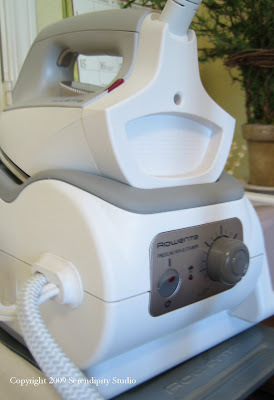 Rowenta makes a steam generator iron (probably not new to a lot of you out there). I decided to give this contraption a try last fall. I admit, the whole "water under pressure" thing sort of freaked me out a little when I first got it, but now I can't imagine life without this wonderful tool. 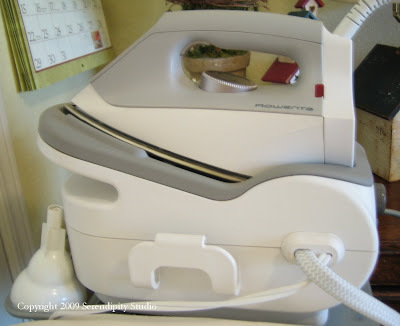 If you iron a lot, it is worth every penny and then some, and here's why....read on! The main difference is this: the water tank holds 4 cups of water at one time and gives you 1 1/2 hours of CONSTANT steam....this means you can sew like a maniac all day and never fill it with water! The biggest benefit is that your iron makes the best, most penetrating steam on the planet! It makes for practically effortless ironing, plus your iron is lighter weight because the water is in the tank, not in the actual iron. You press the button just under the handle to get steam, but that means that you only get steam when and where you want it, which is great also. The heat settings are the same as a regular iron, but one of the best features is that you can turn down the heat and the steam settings separately, so you can use a gentle amount of steam on delicate or even synthetic fabrics (like polar fleece) without damaging anything. This differs from a regular iron in that most of them depend on a high heat setting to generate steam, thus no steam at a low heat setting. I just can't say enough great things about this tool! Of course, once I purchased this iron, I realized that my 16 year old rickety ironing board had to go. The steam generator really needs a stable place to sit, and not just on the end of the ironing board where it may take up valuable space. So I splurged and bought the professional Rowenta ironing board as well. It is extra wide with a shelf out to the side, perfect for holding the water tank/ironing apparatus without being in the way or risking it taking a trip to the floor. There is also a handy shelf below for storing stuff if you need to. I put my extra water and a measuring cup there so that when I need to refill the tank, I have everything I need at my fingertips. The added feature of this board is that it is composed of a steel mesh under the pad so that the steam can fully penetrate the items you are ironing. This helps you to get the most of that steam, with no moisture buildup on the board itself. I bought mine at Bed Bath and Beyond with a 20% off coupon. Lastly, my most recent purchase was for a sleeve board. It is a miniature ironing board, really. It is made for ironing shoulder seams, cuffs, sleeve bands, etc. It may sound like a silly thing to have, but it is wonderful also. What I like best is that I can get small things slipped onto it without creating a crease where I don't want it and I can dictate the direction a seam is pressed very easily. If you don't have one of these, it is worth thinking about, especially if you iron small things. I picked mine up for about $15 at a local JoAnn's, but I am sure there are a lot of other stores and online shops that sell them.